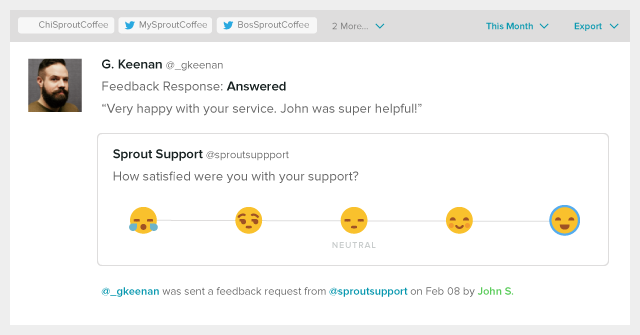 Earlier this year Sprout worked closely with Twitter to integrate Customer Feedback, a new tool that leverages Direct Messages as a channel to gather feedback from customers after a service interaction. Since initial release, Customer Feedback has been used by customer care teams to deliver a simple, but effective request for feedback using a standard Net Promoter® (NPS) question. And, according to Twitter, initial use has shown that Customer Feedback requests receive a response more than 50% of the time. Today, in conjunction with Twitter, we’re pleased to announce that we’ve expanded Customer Feedback functionality to include a second feedback format: Customer Satisfaction, or CSAT, which leverages a five point emoji-based scale. In a world where survey fatigue is a real obstacle in the overall customer experience, a response rate of greater than 50% when using Customer Feedback is quite impressive. According to Forrester research, response rates for traditional surveys used to measure customer experience can be as low as 2% and rarely go over 20%. Unlike more traditional survey methods, Customer Feedback on Twitter enables brands to engage with their customers in the moment. The single question meets the customer in the same place where they just completed an interaction with the brand and at the exact moment that the reaction was completed. This allows brands to capture direct feedback on distinct customer interactions in real-time, on mobile and in an unobtrusive manner. Available in Sprout’s Enterprise level plans, Customer Feedback joins a sophisticated suite of Twitter management tools that help large businesses create an exceptional brand experience on Twitter. For brands, building and improving this customer experience is paramount. In fact, a recent survey of more than 6,000 global business and technology leaders conducted by Forrester demonstrated that improving customer experience is the top business priority for more than 75% of companies. 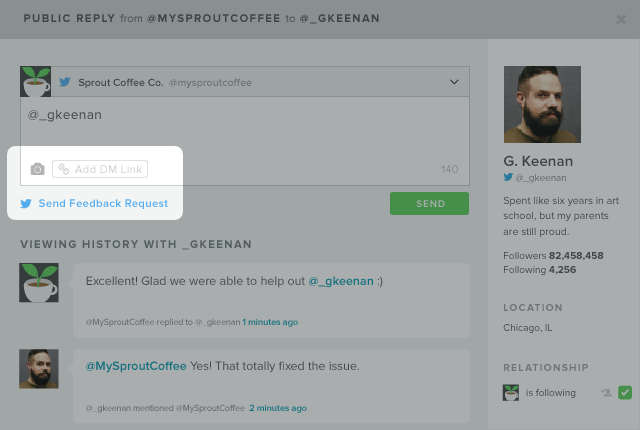 First, your customer care agents click the “Send Feedback Request” button from the Twitter reply screen. This request is meant to be received upon completion of a customer interaction on Twitter. Therefore, the best time to click this button to deliver the request is while sending your final resolution Tweet or Direct Message. That way it is delivered when the entire conversation has come to an end. Next, your customer will receive a Direct Message asking them a simple question to rate their experience. Customer Feedback can be collected in two formats: through a standard customer satisfaction (CSAT) question or by using a standard Net Promoter® (NPS) question. Watch the GIF below to understand the user flow from your customer’s perspective. Lastly, your Social Care Team Lead or Manager can track responses and feedback using Sprout’s new Twitter Feedback report. Responses can be aggregated across multiple Twitter profiles using the profile picker, the date ranges are fully customizable and all data can be exported into a CSV for deeper analysis. Each entry on the Twitter Feedback report displays the status of the “Feedback Response” (Answered or Unanswered), the rating (CSAT or NPS) given by the recipient and an optional comment which can be filled out by the recipient after they rate their experience. 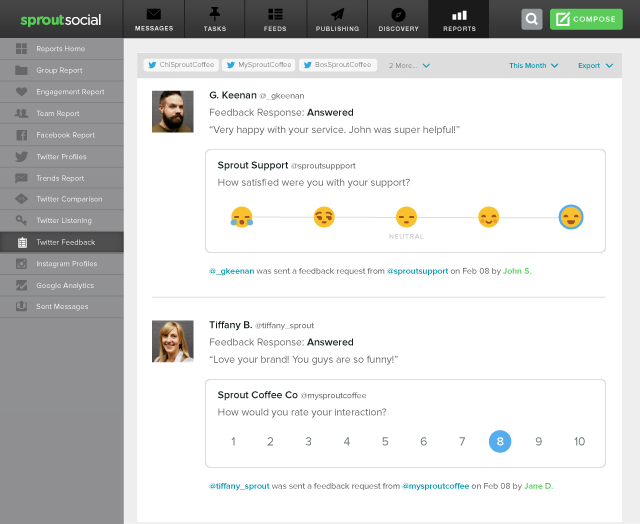 Additionally, each entry displays which customer care agent delivered the feedback request from Sprout. All of this information is also available in the CSV download making it easy for Social Care Team Leads to aggregate the data and analyze responses across dates, profiles and sending agents. If you’re interested in learning more about how your team might use Customer Feedback to better quantify your customer care efforts on Twitter, contact your Sprout representative or email sales@sproutsocial.com.